Manchester, John Rylands Library, Latin MS 83 (Crawford 93) > Moralia in Iob > dated November 26, 914. The name Moralia in Iob or Moralia sive expositio in librum Iob refers to the commentary on Iob’s biblical book written by Gregorius Magnus in the late-6th century. The morals, with 6 volumes in 35 books (PL 75-76 online here and here), is one of St. Gregory the Great’s main and most ambitious works and constitutes one of the most widespread treatises of scriptural exegesis of the middle ages; this work was such a fundamental exegetical reference that an exemplar formed part of almost all medieval monastic libraries. © Rylands Medieval Collection, Latin MS 83, f.4r (n15). Some initial (it starts with Mor. 5, 56) and final folios are lost; “the earlier leaves have suffered much from damp; the first two are only fragments” (see James). “Al principio de este Libro de los Morales de San Gregorio puso el mismo autor (Gomez) la Carta, que el Obispo Tayo escrivió á San Eugenio, Arçobispo de Toledo” (see Berganza). © Rylands Medieval Collection, Latin MS 83, f.80v (n168). The colophon, now lost, has been preserved through the copy made by Father Berganza, 18th-century scholar and abbot of Cardeña: Explicit foeliciter liber Moralium paper Gregorii pars ultima: Deo gratias, Gomez diaconus, peccator, hoc opus era DCCCCLII. VI kalendas decembris, ob iussionem domni Damiani abbatis praescripsi. Following Díaz y Díaz, there is no reason to doubt about its authenticity. Support: well-preserved parchment. Modern binding of brown leather, with blind tooling by Zaehnsdorf. © Rylands Medieval Collection, Latin MS 83, f.268 (n543). No. of leaves & layout: 361 fols. (420 x 300 mm); two columns-47 lines; quaternions; ruled in dry point; collation: i-viii gone except two fragments / ix8-xix8 / xx8-xxxiii8 / xxxiv12 / xxxv8 – lii8 liii (from James). © Rylands Medieval Collection, Latin MS 83, f.142 (n291). (3) a third unknown copyist who supplied the text of fol. 214 (single leaf apparently inserted later between quires 34 and 35 to fill in a lacuna) at some point in the mid-10th century. The codex seems to have been commissioned by abbot Damián and possibly paid by a lay couple (see Díaz y Díaz). Gomez seems to be also the main scribe of a Bible kept at Cardeña (now Archivo de la Catedral de Burgos) around the 17th-century (Berganza, I, pp. 177-178, and II, pp. 578-590). © Rylands Medieval Collection, Latin MS 83, f.298 (n603). Illuminator/s: unknown. 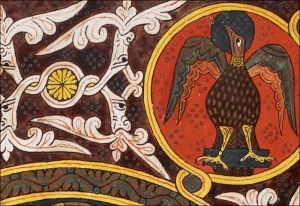 The manuscript contains a number of small decorative initials, birds, animals, fish, and human figures that have been supposed to be purely decorative. Script: Visigothic minuscule script (with marginal notes). (The text of Job is written in red throughout). * Codicological and (excellent) palaeographical analysis, with notes on ornamentation, by Shailor. © Rylands Medieval Collection, Latin MS 83, f.302 (n611). 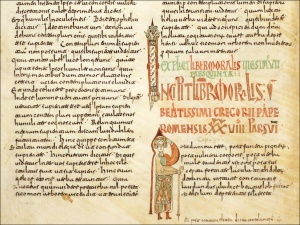 Origin: The codex was written at the monastery of San Pedro de Cardeña (Burgos). Provenance: From the Bateman Library (lot 882 in the sale of 1893) to the Bibliotheca Lindesiana and the John Rylands Library. Context: For other manuscripts with the same work prior to the 13th century and copied in the Iberian Peninsula see Suárez. 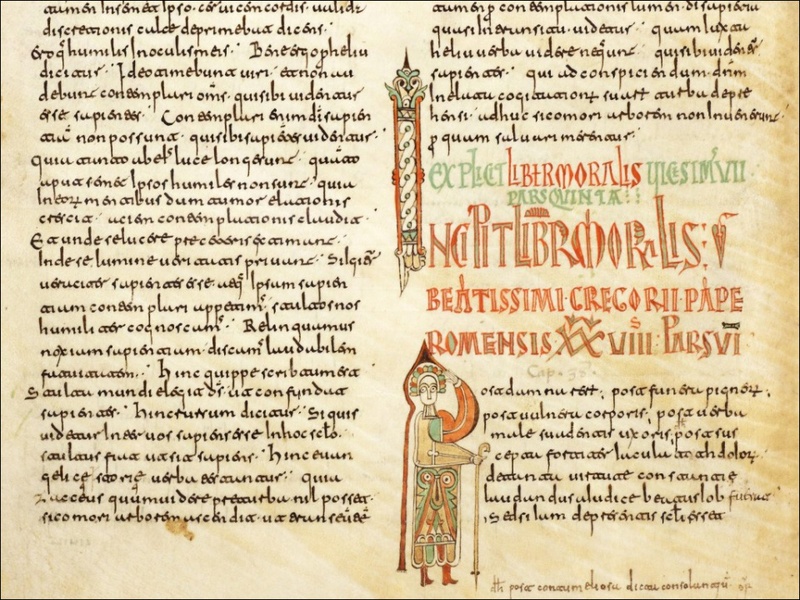 To search for those copied in Visigothic script, go to the Excel list of manuscripts here. The Rylands Medieval Collection also has two other Visigothic script manuscripts: Latin MS 104, a late-9th-century Smaragdus, In regulam sancti Benedicti [digitised] thought from the same scriptorium, and Latin MS 89, a mid-10th century Cassiodorus, In Psalmos [digitised] from the “school” of Florencio de Valeránica. © Rylands Medieval Collection, Latin MS 83, f.284 (n575). M. C. Díaz y Díaz, Códices visigóticos de la monarquía leonesa, León 1983, 334, nº 38. J. Guilmain, “On the chronological development and classification of decorated initials in Latin manuscripts of tenth-century Spain”, Bulletin of the John Rylands Library Manchester 63 (1981): 369-401. A. Millares Carlo, Corpus de códices visigóticos, Las Palmas de Gran Canaria 1999, 147, nº 219. B. A. Shailor, “The scriptorium of San Pedro de Cardeña”, Bulletin of the John Rylands Library Manchester 61 (1978-1979): 444-473. J. Wasselynck, “Les compilations des Moralia in Job du VIIe au XIIe siècle”, Recherches de Théologie Ancienne et Médiévale XXIX (1962): 5-32.